I have previously mentioned that I am not a fan of follower services that require you to disclose your twitter password. I have created a test account to give this a try and registered with a few of these services. As it turns out this is even more abusive than you would expect with the account password suddenly changed and multiple requests to reset the password, but that's not the worst of it. 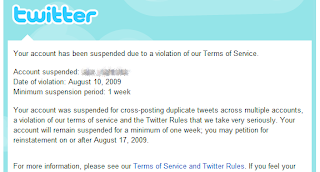 Today I received an email from twitter.com that the account was suspended due to a TOS violation, for cross-posting duplicate tweets across multiple accounts. Since I haven't used the account at all that means that the repeated advertisement posts by the different services have triggered the spam heuristic of twitter. On a side note, the account had about 500 followers and was following about 1500 users, so this was not really worth it, you can get this number of followers by normal activity without spamming.